Whether you’re taking care of your own yard or you landscape for a living, having the right tool can make any job faster and easier. Shindaiwa has listened to their customers, updating their brushcutters to deliver more power and torque to get the most out of cutting blades while being easier to operate and maintain, so they’ll still be your first choice for trimming grass. Shindaiwa currently offers four models. The C262 and C302 are all new, while the C282 and C344 have been updated. Shindaiwa’s smallest model is 70.5 inch long and weighs just 12.3 lbs. It’s powered by a 25.4 cc two-stroke and uses a 1.62:1 gear reduction for more torque at the head. The head and engine are linked using a solid steel drive shaft. The C262’s 2-in-1 debris shield works with both trimmer line and blades, making it easy to switch between mowing and cutting. When using line, this model cuts a 20-inch swath. A shoulder harness is included. While slightly shorter than the C262, this brushcutter weighs in at 15.7 lbs. This added weight is due to a larger 28.9 cc engine with electronic ignition and a bicycle-style handlebar that makes the cutting head easier to control when cutting brush and saplings. This model is intended mostly for cutting, limiting the maximum cutting swath to just 15 inches, Both a speed-feed head and blade hardware included. This model uses a solid steel drive shaft. With its 30.5 cc engine and 1.8 hp output, the C302 is the most powerful trimmer in Shindaiwa’s lineup. A 1.62:1 gear reduction head increases torque. Even with all this power, it weighs in at 14.8 lbs. It has a bicycle handle like the C282, but it comes with over-molded hand grips like you’ll find on power tools. This adds a rubber layer around the plastic where you need it to quell vibration while keeping weight down. Weight is further reduced by using a magnesium fan housing. A flex cable sends power to the head while absorbing engine vibration. The cutting swath of this model is 20 inches. For easier restarts, the carburetor is equipped with a bellows intake that draws in cool air away from the engine. Want a powerful brushcutter without the compromises of a two-stroke? This model comes with a 34 cc 2/4 stroke engine. This Shindaiwa-exclusive design combines a four-stroke cycle with a two-stroke oiling system, so it stays lubricated no matter how you turn it. This keeps emissions and fuel consumption down and makes the engine much easier to start than two-stroke models. The C344 is the heaviest brushcutter at 15.6 lbs, but otherwise, it’s mostly similar to the C262. A speed-feed head and blade hardware are included, it uses a solid steel driveshaft, and it cuts a 20-inch swath. The controls are mounted on a bicycle handlebar with rubber grips. The 9-inch. 4-tooth blade fits all blade-capable straight shaft brushcutters. It’s perfect for light brush, shrubs, and grass. All other cutting blades are designed to fit the C242, C254, C282, and C344. The 10-inch, three tooth blade is perfect for cutting thick brush. The 9-inch maximum duty blade works well cutting undergrowth and thinning out small saplings. The 8-inch heavy-duty blade has saw teeth that can chip away wood, which is great for cutting down young trees. Shindaiwa redesigned their debris shield, adding more protection while still being compatible with older models. The Pro Harness distributes weight using wide hip and shoulder pads, increasing operator comfort and reducing the chance of contact with the line or blade. Getting parts for maintenance is easy thanks to Shindaiwa’s “Youcan” maintenance kits. Two versions are available: one has everything you need to do a tune up, while the other includes everything needed to rebuild the fuel system. 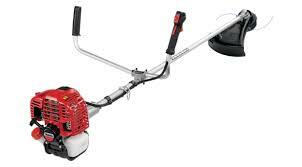 Shindaiwa guarantees all of their brushcutters for two years commercial of commercial use or 5 years of consumer use. Shank’s Lawn Equipment is an authorized dealer for Shindaiwa, so we can provide you with equipment, parts, and support for anything from the company. Visit our shop at 4900 Molly Pitcher Highway in Chambersburg, PA. That’s one mile east of Interstate 81 via Exit 10 to Marion. We also ship OEM parts and accessories for Shindaiwa and many other brands across the U.S. and Canada. If you need something for your brushcutter, visit www.shankslawn.com. This entry was posted in Uncategorized and tagged Shank's Lawn, Shindaiwa Brushcutters, Shindaiwa parts. Bookmark the permalink.